ST. GEORGE — Failure to yield to an oncoming car severely damaged both vehicles Monday night in St. George and caused one person to be taken to the hospital with neck pain. An Oldsmobile was headed eastbound on 700 South at River Road just after 7 p.m. and attempted to make a left turn onto River Road, St. George Police Lt. Doug Sargent said. “It did not yield to the other vehicle which was going straight through (westbound)…coming from Foremaster. (The Oldsmobile) turned right in front of it,” Sargent said. The second car, a Mazda, hit the Oldsmobile in the passenger side door, spinning it around. 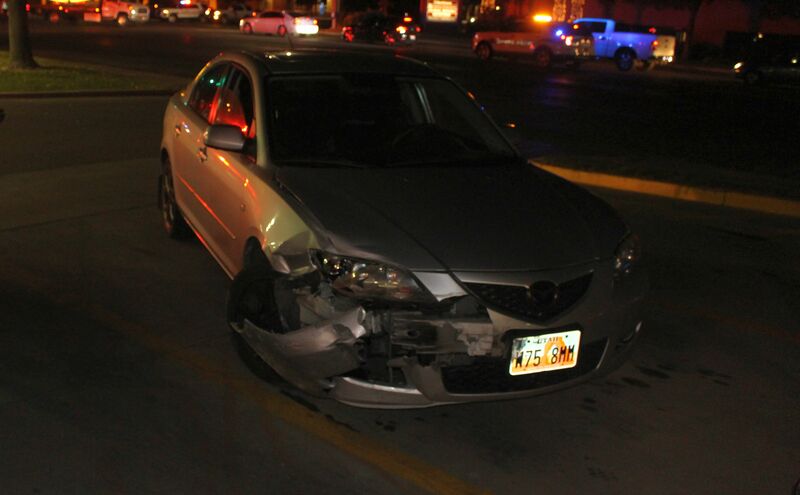 The driver of the Mazda was able to move the car across the intersection into the Maverik parking lot. The Oldsmobile had a family in it. The driver and a small child, who was in a car seat, were uninjured. The passenger in the Oldsmobile complained of neck pain, Sargent said, and was taken to Dixie Regional Medical Center in St. George. Sargent said the Oldsmobile driver was issued a citation for failure to yield at the scene. The crash slowed traffic on River Road for about 45 minutes. I guess I missed something…How did the tricycle enter into the scene? I will say this…I’m a much more paranoid driver here after a couple years of reading St George News! Then again, there’s Vegas, L.A., etc, etc.